Another week, another edition of my Monday Meme Trifecta, where I compose a post that’s appropriate for Manic Monday, Blue Monday and Mellow Yellow Monday. Today we’re going to talk about aquatic preserves, specifically the ones that are located off the Florida Gulf coast in Charlotte and Lee counties. I found this sign posted at the boat ramp on the east end of Sanibel Island – when you come across the causeway and finally make land on Sanibel itself, you’ll see the parking lot for the boat ramp immediately to the left. I snapped the photo to remind myself to do some research about the aquatic preserves pictured, and find out exactly what an “aquatic preserve” is. Aquatic preserves can be composed of a variety of community or habitat types. The yellow parts on the map are dry land, the edges of which border mangrove forests, seagrass flats and salt marshes, all of which are wet. The green parts are where the seagrass communities are located. These areas make a fine hatchery and nursery for a wide variety of aquatic life. The aqua-colored parts of the map define the extent and boundaries of each preserve. One of the more interesting things I discovered about the aquatic preserves is that they often encompass sites of historical interest, specifically encampments and settlements of both Native Americans and European explorers and settlers. Quite a few of these are represented by shell mounds, the purposes of which are not clearly understood; perhaps they really are just kitchen middens/refuse piles, or perhaps there was some ritual reason for building them. Due to rising sea levels, many of these sites are now completely submerged under water – talk about wet! I’m feeling like a Manic because it’s a Monday!!! You always do an excellent job of combining memes. This one is truly interesting since it shows the effort to preserve these natural places for the future. Great post! I love how you joined three memes into one. Even better is the theme on aquatic preserves. It is something we really have to care about. Best wishes. That’s clever of you to have 3 memes in a post. Living in a small country and not having many big rivers and lakes, we are constantly on the search for solutions to our water problems. You can’t miss the blues when you’re outside–especially in the Sunshine state! Thanks for sharing. Happy Blue Monday. I am so impressed at your ability to cover three memes in 1 post! I also love the information about the historical significance of some aquatic preserves. There’s a shell ring in a preserve on Hilton Head Island that dates back to 1450 BC. It’s the garbage dump of the native Indian population. Nice work! You can claim the title of Champion Meme Multitasker. “Grand Champion” requires four or more… or so I’ve heard. I’ve never attempted it. 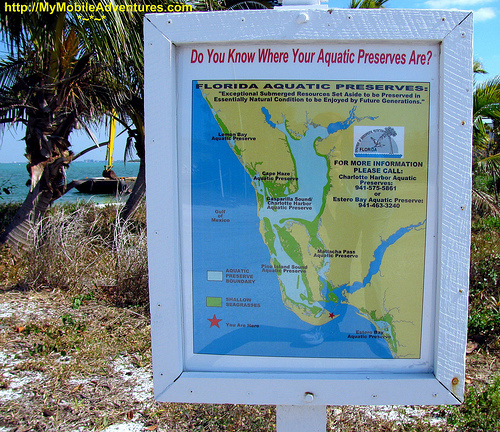 Great picture of the aquatic preserves map. Interesting post. There’s also a touch of yellow on the sail boat in the background. what a good job three in one and very interesting, thanks for sharing.. Wait? I think I can see a touch of green in there too! LOL! That’s a shame that some of the sites are disappearing. But I guess that’s the way of things these days. Hi Tink, Nice map, Happy Blue Monday! Mary :O) P.S. I’m a BIG Disney fan! What a terrific post on aquatic life information! I honesty enjoyed reading it, and my own site is about Ocean Life so I’m not just saying so lightly. Keep up the excellent work! What a great post on aquatic life information! Seriously, some of your best work. I can’t argue with one word of it, and I just subscribed to your feed. In the future, how about a post on ANCHOR_TEXT%? Cheers!